Editorial: Keeping Safe from Carbon Monoxide. The request to post this information came at a time when I was ruefully realising that our boiler service slot has come and gone again and I’m late organising it. The small £20 monitor we have been sent could save the life of an entire family and could be the difference between vulnerable young children waking up in the morning or never doing so again. Please consider buying one. There’s a silent killer on the loose that claims 40 lives every year in Britain and puts 200 others in hospital. It sounds like something from a horror film – but this is carbon monoxide and it’s very real. Worryingly, this colourless, odourless and tasteless gas can be inhaled by you and your family without even knowing it. It’s produced by household appliances such as boilers, cookers, fires and heaters – and if one of those has a leak, the results could be deadly. A blocked flue or chimney can also cause the levels of CO to rise in the home. Symptoms to be aware of are headaches, dizziness, nausea, breathlessness, leading to collapse and loss of consciousness. Most deaths that occur by carbon monoxide poisoning are at night when people are asleep in their beds. It is scary – but there are ways to protect yourself. Safety advice is that all your appliances must be checked regularly by a Gas Safe Registered engineer. If you suspect there is a leak in your home, open all doors and windows and get all people and pets out of the house as quickly as possible. 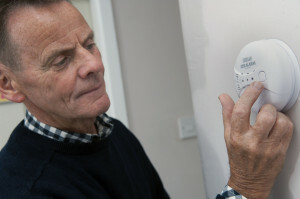 A carbon monoxide detector in your home could also be a lifesaver. Boiler and central heating cover company CORGI HomePlan is currently campaigning for every home to have one of these simple little white boxes. They are relatively cheap (£30) and work as an early warning system similar to a smoke detector. They work all around the home and can be taken with you on camping trips or caravan holidays as a number of deaths occur each year from portable barbecues and poorly maintained gas equipment in caravans. CORGI HomePlan has produced a microsite dedicated to home safety tips – www.corgi-homeplan-how-safe-is-your-home.org – which is a great resource of advice covering all gas and electrical appliances in the home. There are easy to follow tips and ‘how to’ videos to give you peace of mind as we come into the colder weather when boilers are being switched on across the country again. It’s such a simple decision to get a carbon monoxide detector that no home should really be without one. Disclosure: we were gifted a Carbon Monoxide monitor in exchange for this post. Please do take notice of the message, it is so important.